It’s hard to imagine a more challenging design project than this one: building a new private residence within the nationally designated historic district of Charleston, South Carolina. The city has been a staunch guardian of its cultural and physical structures since 1783, and was the first in the nation to protect its historic areas with a preservation ordinance. Residents regularly debate the pros and cons of new construction on “infill sites” as the city strives to retain its characteristic charm despite the current building boom. But the expertise of architects John Young and Phillip Dufford in both historic preservation and new construction made them ideal for this project. Their client requested a home with a quiet presence on the exterior and an accessible formality on the interior, with great flow and plenty of natural light. The kitchen and adjoining butler’s pantry were key components of the design. Everything about the kitchen is clean, classic, easy flowing. 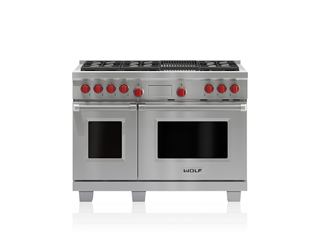 It is a study in black and white, with the only color coming in the familiar form of the signature red control knobs on the Wolf 48” dual fuel range – the focal point of the kitchen, chosen for both its bold simplicity and unrivaled cooking performance. 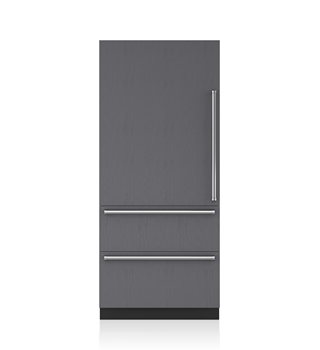 Sub-Zero refrigeration integrates subtly, seamlessly into the white cabinetry. The butler’s pantry, which leads into the dining room, is a quietly beautiful contrast to the kitchen, with gray cabinets and white countertops. Like the rest of the house, the kitchen and butler’s pantry have the function and flow to please any modern homeowner, but also a quiet elegance and charm. Architects Young and Dufford had to deal with severe constraints in creating this residence – everything from flood zone requirements to hurricane resistance to city requirements for conforming to the height, scale and massing of neighboring buildings – but the result is a tasteful, timeless residence beautifully woven into the fabric of the Charleston historic district.